A politically weakened U.S. president is pulled by a powerful domestic lobby and influential foreign governments toward launching a war that U.S. imperialism right now doesn’t want, that the world doesn’t want, and that the large majority of the American public doesn’t want — what will be the outcome? 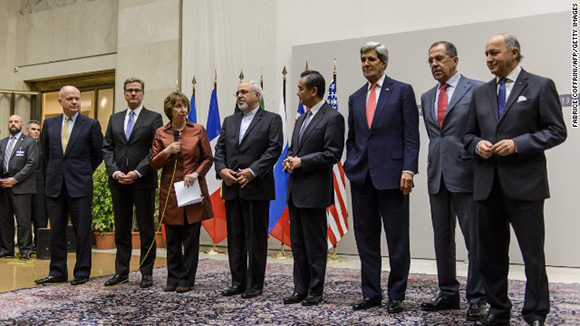 Top officials and negotiators announce a deal between the U.S., Iran, and European allies. It’s an interesting, if dangerous and scary, test of how U.S. politics actually work. The initial results, at least, are in: The unleashed fury of the Israeli government and the “pro-Israel” lobby, the monarchy of Saudi Arabia, the neoconservative warmongers and the much-feared religious right weren’t able to block the Obama administration and European partners from reaching a six-month interim agreement with Iran over that country’s nuclear enrichment program. Any socialist, progressive or sane person must welcome this agreement. That’s not because it resolves the proliferation of nuclear weapons, or changes the hideous character of the Iranian regime in relation to its own population, or addresses the multiple underlying issues of the Middle East crisis — it does none of these things — but because it pushes back the imminent danger of a really catastrophic war. That’s one strike against the widely held theory that the toxic influence of the Israel Lobby can drag the United States into wars that this country‘s ruling class disapproves. The Republican Party has regained big chunks of the ground lost during its own government shutdown fiasco. It’s true that Congress’s approval ratings remain even deeper in the toilet than the President’s, but that fact affects both capitalist parties — and now, Congressional Democrats who stood united against repealing “Obamacare,” because that would have represented the effective end of the Obama presidency and virtual suicide for the party, are angry, alienated and afraid to be near him. Whatever political capital the President had for immigration reform, seriously raising the minimum wage, protecting food stamps from savage cuts, or much of anything else including the climate change crisis, has been dissipated. The Democrats’ chances of regaining the House of Representatives in the November 2014 midterm election, marginal to begin with, are now much less than those of losing the Senate as well. In these circumstances, this might be considered a favorable moment for the power of the Israel Lobby, Saudi Arabia and rightwing militarists to derail the Obama administration’s deal with Iran. In fact, France made a last-minute move to block the first version of the interim agreement — right after Saudi Arabia signed off on a huge purchase of French weapons (a point worth noting in case anyone thought it’s only the USA that has a military-industrial complex). The President’s loss of control over his own party is such that many prominent Democratic Senators have taken to the airwaves loudly denouncing his “appeasement” of the Iranians and abandonment of Israel in its hour of existential peril. Yet the interim agreement — prepared, as we now know, by secret direct discussions between U.S. and Iranian representatives — went through, suspending parts of Iran’s enrichment program and releasing a few billion Iranian dollars held in frozen accounts abroad. That’s actually a small deal in relation to the overall brutal sanctions imposed on Iran’s economy. But as a political breakthrough it’s wildly popular inside Iran, and approved by a strong majority of the U.S. population that’s sick and tired of post-9/11 wars that begin with glowing promises and end in disaster. In fact, the Iranian nuclear program is no “existential threat” to Israel — not even close. Iran has no nuclear weapon, is not close to one, claims it doesn’t want one, in any case cannot make or test one without detection, and — most important — has no means of delivering such a weapon. All this is commonplace understanding among intelligence services (including Israel’s) and everyone who’s not mesmerized by Netanyahu’s grandstanding. Meanwhile, of course, Israel has its own undeclared arsenal of hundreds of ready-to-launch nuclear bombs. The real “threat” here is not to the Israeli state’s existence, but to its longstanding status as the overwhelming regional military power and its guaranteed status as the only privileged U.S. ally in the area. 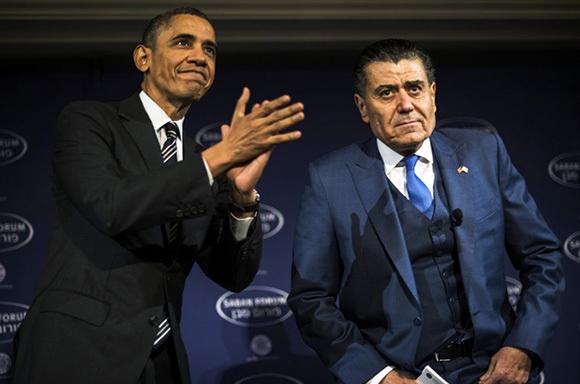 Obama talking with Israeli-American media figure Haim Saban; the President repeatedly assured his audience that U.S.-Israeli relations are still strong. That status allows Israel to terrorize its neighbors at will, especially Lebanon, to run amok in its colonization of the Occupied Palestinian Territories, to bomb and invade Gaza on any pretext or none, and to carry out assassinations outside its territory, including notoriously the murder of several Iranian scientists. When it comes to the destruction of Palestine, nothing of substance will change. The broader strategic scene, however, is shifting. After its debacles in Iraq and Afghanistan, the unplanned consequences of the bombing of Libya and its inability to control the outcome in the Syrian tragedy, U.S. imperialism needs to cut its reliance on direct boots-on-the-ground and massive bombing campaigns to keep “order.” Drone warfare and Special Forces operations, the symbols of America’s capacity to strike viciously and murderously with legal impunity, can only accomplish so much. To keep the region safe for investment and oil and to contain if not defeat the Sunni/al-Qaeda jihadist resurgence, U.S. interests require making deals with a number of regional forces — including Turkey, Iran and now, it seems, even the loathsome Syrian regime. It’s not that there is anything progressive or democratic about this shift, or anything to do with human rights. Those are not Great-Power concerns. It’s just realism: The United States can’t unilaterally hegemonize the Middle East, as the lunatic elements of the neoconservative movement believed, especially when also having to navigate complicated new problems with China in the Pacific, Russia in Eastern Europe, and its own troubled economy and fractured domestic politics. The U.S. partnership with Israel is definitely a component of the emerging strategy of regional understandings, but not the only one. In fact, above all, if the U.S. extraction from Afghanistan is to be accomplished without a total collapse of the Afghan state, and if Syria isn’t to become a permanent wasteland with jihadist enclaves embedded inside, some kind of U.S.-Iranian détente is going to be essential — with Russia, Turkey and the European Union also on board. That’s the real backdrop of the next six months of negotiations with Iran, much of which will be occurring in secret back channels. It’s about much more than Iran’s nuclear program — and that’s exactly what’s anathema to Israel’s rightwing government, to the “pro-Israel” Zionist and Christian religious right U.S. lobby, and to the Saudi and other Gulf oil monarchies. What they fear is Iran’s conventional military power, its political outreach to the region’s Shia populations, and the capacity of its intelligence services to compete with the rest in the tradecraft of murder, mayhem and malicious mischief. For these forces, then, it’s essential that any U.S. deal with Iran must fail. As the Roman Senator Cato the Elder famously proclaimed in every speech that “Carthage must be destroyed,” the Netanyahu mantra holds that Iran must be destroyed. Netanyahu, of course, is not the imperial ruler but only a junior partner who cannot attack Iran alone — and even if he may believe that Israel has the capacity to do so, his generals know better. Netanyahu does have, of course, the U.S. Israel Lobby with its considerable power of intimidation and blackmail. Readers will recall the spectacle of the Israeli leader speaking to a joint session of Congress in May 2011, openly ridiculing president Obama’s and official United States policy on Israeli settlements in occupied Palestine, with 500-plus Congresspeople and Senators from both parties jumping up and down like so many trained chimpanzees. The Lobby is gearing up for the fight to come. 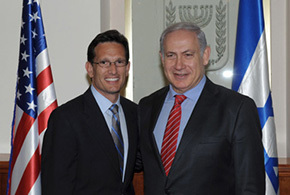 At this writing, Eric Cantor, Netanyahu’s front man in Congress, has introduced legislation demanding the complete dismantling of Iran’s uranium enrichment capacity. Senators from the left and right, a united front including some of president Obama’s usual strong Democratic supporters and reactionaries who want to destroy him, are also proposing harsh new sanctions aimed at cutting off all of Iran’s remaining oil exports. It’s important to understand what this battle entails. The stated demand of the Israeli government is that Iran must not only cease enrichment but ship all its centrifuges outside the country and dismantle its hardened underground Fordo facility, the one place that Israel can’t bomb. No Iranian government could conceivably accede to these conditions — but that’s the point of the plan. The war party’s strategy depends on the negotiations’ failure, and beyond that on Iranian president Rouhani’s government falling apart. Their tactic is to impose such extreme measures that the hardliners in Iran take over, and the regime is squeezed to the point where it might make a desperate ”dash” for a nuclear weapon. At that point, the seekers of war calculate that Israel could force the United States into a fullscale military operation and that Europe, Russia and China would stand by. To think about the consequences of this logic is to recognize its potentially suicidal implications, and to realize that it’s a rather desperate rearguard action against the logic of the new U.S. imperial project in the Middle East. It would also risk the unity of the various countries supporting the current sanctions program. While the House of Representatives might adopt Cantor’s toxic legislation, it’s likely that leading Senators, even many of those now lining up to fill their campaign coffers at the AIPAC trough, will at least delay the course leading to the ultimate confrontation. The alienation of many American Jews from Israel will deepen if they see its government pushing a war that they, like the majority of the U.S. population, absolutely don’t want. Israel and its Lobby are a powerful tail, but not strong enough to wag the imperial dog when real global stakes are involved — not a secondary question like the fate of Palestine, but the danger of a major unraveling of U.S. policy. The dangers, however, remain. It’s quite possible that Israel would undertake some major provocations in the coming months. The Obama White House might feel it necessary to do something to look tough. Iran’s rulers might miscalculate if new sanctions legislation looks like passing Congress. The risk of any particular crisis leading to escalation and unintended catastrophe are small, but over time the cumulative risk of apocalypse most certainly isn’t. Short of a nuclear-free Middle East that can only arise from a profound democratic transformation of the entire region, the danger is ambient. And as satisfying as it is to see the defeat of the Israel Lobby’s current war drive, and as much as the Iranian people deserve relief from the cruelty of sanctions and of their own rulers, the issues that produce one crisis after another remain.